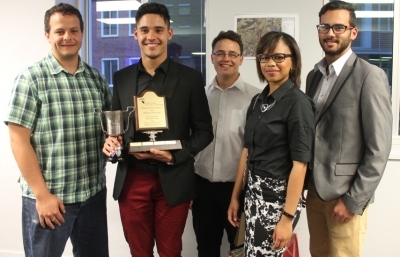 Excellent students within the Town and Regional Planning department at CPUT were commended at an Awards ceremony event recently. To receive this award, students needed to achieve top marks in a variety of subjects like Planning Design, Planning Theory and Computer Aided Design. Adriaan Neethling, Bella Jirri, Gregory Joubert and Shannon-Lee Newman were all recipients however one student, Jevon Jacobs, stole the show receiving a staggering six awards including the Dean’s Merit Award for Academic Excellence. Jevon achieved 99% for his presentation on his Work Integrated Learning project which focussed on a high density development for the Kleinvlei area. Lecturer Rayner Moodley commended Jevon for his excellent presentation style and subject choice saying he was destined for big things. Deputy Dean for Informatics and Design Colin Daniels thanked the parents who were present for assisting their children to achieve academic excellence. “No student can achieve this level of academic success if they are not fully supported,” he says. Keynote Speaker Quahnita Samie, who is also a CPUT Town and Regional Planning alumnus, gave insight into her passion for heritage resource management. Her company Vidamemoria is currently busy with the heritage status of The Bo-Kaap, Kramats, District 6 and Gugulethu 7 sites. Reflecting on some of the planning injustices of the past she encouraged the students to use their hearts as well as their heads when working. “Planning is about more than just a line on a map, it affects people’s lives. Sometimes as planners we forget that,” she told the audience.